Samsung has already promised that its forthcoming Galaxy S10 smartphone will feature "very significant" design changes. However, thanks to a new patent filed by the technology jumbo-corp, we now have a much clearer idea exactly what those design changes are likely to be. The document, which was filed with the World Intellectual Property Office (WIPO) and spotted by those eagle-eyed folks at Let's Go Digital, depicts a swathe of different smartphone designs with the Infinity-O design showcased alongside the folding Galaxy X handset earlier this month during Samsung's annual developer conference in San Francisco, California. The Infinity-O design is a truly edge-to-edge screen design, with only a small pinhole cut-out for the camera lens breaking the all-screen look. Illustrations filed with the patent show the cut-out in a number of different positions across the display, however, it appears Samsung is leaning towards locating the camera in the top-left. That's because the only two illustrations rendered in colour with a mock lockscreen design – Model A and Model B – both position the Infinity-O's trademark cut-out in the top left-hand corner of the display. 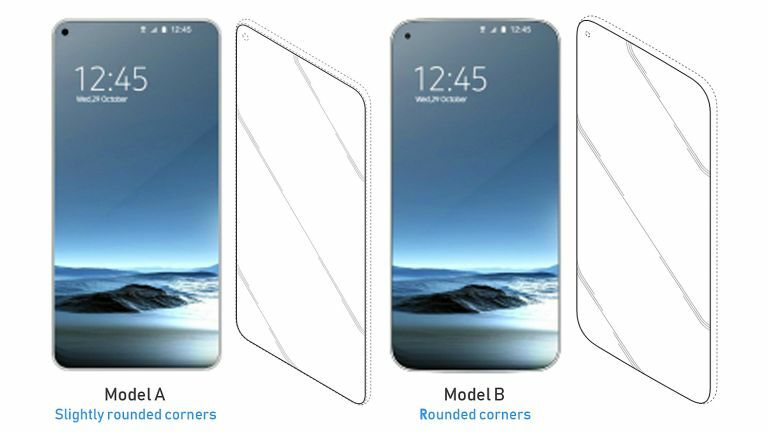 Model A has squared-corners reminiscent of the Galaxy Note9, while Model B appears closer to the Galaxy S9's curvier design. Other models included with the patent, such as C, E, F, and J, feature curved edge glass in slightly different places as well as various cut-out configurations. Whichever design the company decides to plump for, it really looks like Samsung's pledge to introduce "very significant" design changes wasn't just marketing fluff. The Galaxy S10 looks set to be a truly unique flagship smartphone. Elsewhere, the Galaxy S10 should include an ultrasonic fingerprint scanner embedded beneath the display, as well as a triple camera system on the back of the phone that combines an ultra-wide and telephoto lens with the standard, variable aperture shooter introduced with the Galaxy S9 last year. We're expecting Samsung to follow tradition and announce the Galaxy S10 during the first quarter of 2019: most likely around the end of February or the start of March during the annual Mobile World Congress show in Barcelona.